After the crisply shot mind games of The Master, Paul Thomas Anderson goes all warm and fuzzy with a film that follows a perma-stoned private detective on a fabulously befuddling quest, and apes the aesthetic of faded film stock. 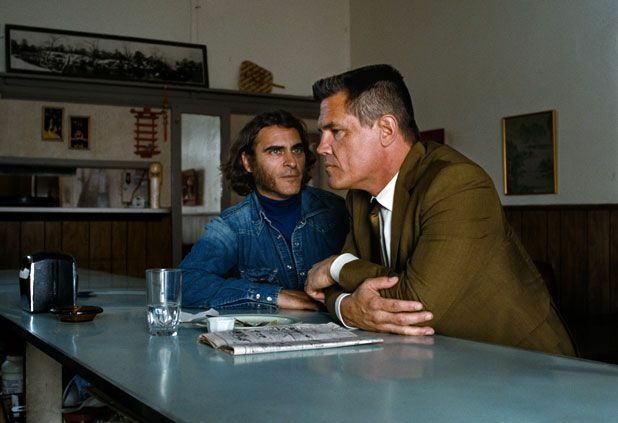 Like the Thomas Pynchon novel on which it's based, Inherent Vice is an anti-thriller, a loose, lunatic, sun-scorched noir that just keeps piling on the madness. Part paranoid pulp, part chaotic comedy, Inherent Vice channels anti-establishment discontentment through an adorable schlub of a lead: the mutton-chopped, shaggy-haired hippy Doc Sportello (Joaquin Phoenix). It's 1970 and Doc is on the trail of disappeared property developer Mickey Wolfmann (Eric Roberts) – the current squeeze of his 'ex-ol' lady' Shasta Fay Hepworth (Katherine Waterston) – who seems to be connected to a number of other local mysteries. Along the way, Doc falls foul of a shadowy organisation known as the Golden Fang and reluctantly teams up with his nemesis Bigfoot Bjornsen (Josh Brolin), a LAPD detective with a hatred of hippies. The convoluted plot is merely the mechanism through which Anderson introduces a cast of assorted nuts. Phoenix demonstrates impeccable comic timing and showcases a winning range of bemused expressions and Brolin makes a brilliantly po-faced, flat-headed foil. Those who love the book should feel reassured as it's been cast to perfection, with Benicio Del Toro, Reese Witherspoon and Owen Wilson amongst the supporting players. With lines like, 'He perished in a trampoline accident,' rubbing up against, 'It's not groovy to be insane,' the script (pure, almost untouched Pynchon) is an unalloyed joy. Inherent Vice is its own enjoyably badly behaved beast; it's a film that moves at a pothead's pace and trades revelations for anticlimaxes. However, tune into its wavelength and you'll dig it just fine.